This is a view of the reverse side of the ASTRO solar array, with Earth below in the background. Clear views of the rotary joint and array circuits can be seen. Despite arocky start, two unmanned spacecraft have succeeded in their first autonomous satelliterefueling demonstration while orbiting high above Earth. The ASTRO satellite,one of two spacecraft flying the OrbitalExpress refueling mission, successfully pumped vital hydrazine fuel intoits NextSat counterpart as part of Scenario 0-1, the first in a series ofincreasingly challenging tests. "The firstOrbital Express demonstration, Scenario 0-1, was very successful," aspokesperson Jan Walker for the U.S. Defense Advanced Research Projects Agency(DARPA), which is overseeing the mission, said in a written update Wednesday. "ASTROtransferred just under 32 pounds (14 kilograms) of hydrazine to the NextSatclient, meeting the scenario objective." Walker saidthe robotic arm-equipped ASTRO, short for AutonomousSpace Transport Robotic Operations, first delivered the hydrazine during theearly hours of April 1 via a fluid hookup, and then followed up by transferringan additional 19 pounds (8.6 kilograms) of propellant to NextSat a day later. NextSatwas due to return propellant to ASTRO sometime today, she added. Inaddition to refueling demonstrations, ASTRO is also designed to perform taskssuch as autonomous undocking, proximity operations and re-docking, as well asuse its robotic arm to install a battery on NextSat. OrbitalExpress mission managers believe the technology onboard ASTRO and NextSat couldallow future military reconnaissance satelliteskeep station over targets on Earth by providing a renewable propellant source.The technology could also help extend the lifetimes of general-use satellitesby allowing in-flight repairs, equipment replacements or upgrades, missionmanagers have said. TheOrbital Express mission, however, did suffer a glitch shortly after launch. Theincorrect installation of a pitch momentum wheel aboard ASTRO led the spacecraftto react opposite of what its onboard navigation software intended, DARPAofficials said. "Itwas a combination of hardware and software issues," Walker said of the glitch,adding that flight controllers relied on NextSat's navigation systems to orientASTRO's solar panels towards the Sun until new software could be uploaded. "Withthe updated software, [ASTRO's] commands result in the expected pitch wheelmotion." 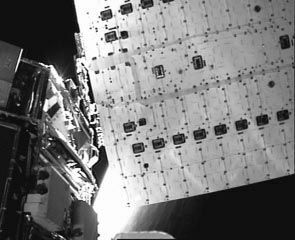 ASTROhas already employed a camera on its robotic arm to snap about 1,600 images ofitself and NextSat, currently mated to one another, which Orbital Expressmission managers assembled into a video. ASTRO'sApril 1 refueling operations with NextSat were performed under a low-autonomylevel, requiring the spacecraft to receive a total of 23 approvals from flightcontrollers on Earth, Walker said. Later this week, ASTRO will transfer abattery from its bay to a corresponding slot aboard NextSat, she added. OnApril 16, the separation ring joining the two spacecraft together will bejettisoned to mark the beginning of rendezvous and capture activities, Walkersaid. TheOrbital Express mission launchedon March 8 as part of the U.S. Air Force's Space Test Project-1 (STP-1)mission, with ASTRO and NextSat vehicles successfully reaching orbit alongside fourother small satellites. The$300 million mission is expected to run about 91 days. Boeing's Phantom Worksled the 2,100-pound (952-kilogram) ASTRO vehicle's development, while BallAerospace oversaw construction of the 500-pound (226-kilogram) NextSat forDARPA. Is Emperor Palpatine Returning in Star Wars: The Rise of Skywalker?